You think about the future a lot. You know you need to apply what you've learned in the classroom to the real world. But aren't sure exactly where to start. What you do in your college years sets the stage for your entire career. Make it count. Internships provide real world job experience between academic sessions. C&S offers part-time internships during the school year for 10-20 hours per week and summer internships which typically run from May – August each summer. The expanding relationship between C&S and local colleges in the Monadnock region was recently featured in the Supply Chain Management Review. Co-op employees are enrolled in a cooperative education program at an accredited four- or five-year college or university, pursuing a bachelor's or advanced degree. You can work any time of the year, including part-time, and can be enrolled in either a technical or non-technical discipline. Most managers prefer co-ops to work a six to seven month period, although there is flexibility within this requirement. 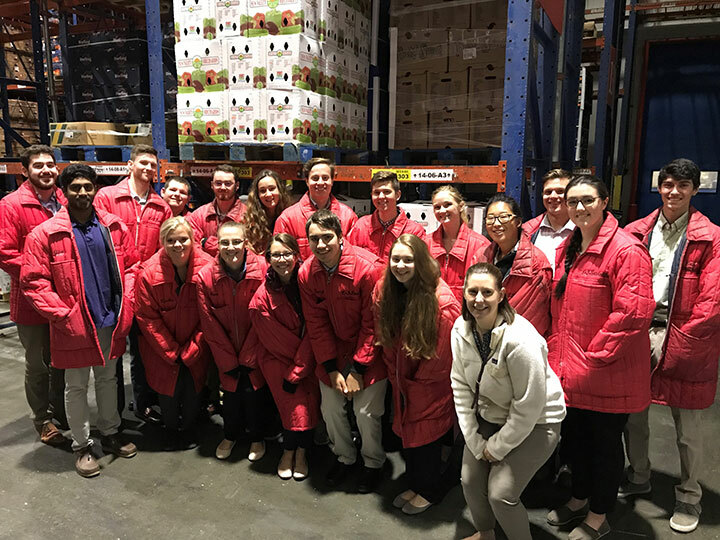 Learn about C&S through warehouse tours, department spotlights and collegiate "lunch and learns"
As part of the C&S Internship Program, you will gain real world experience through interesting, challenging and meaningful work while contributing to the bottom line. As a $28 billion company and ranked as one of the ten largest privately held companies in the U.S. by Forbes, C&S is the ideal place for you to make professional connections, get hands on skills and see the latest technological tools in action. But it's not all about work, our internships include time for networking with other interns and C&S employees, training geared towards college students on topics such as business etiquette and learning about the different business areas. During a C&S internship, you will work on challenging tasks that directly impact the bottom line. Network with C&S leadership and other young professionals, and create an opportunity for full-time employment at C&S after graduation. You’ll learn about C&S through warehouse tours, department spotlights and collegiate lunch and learns while also making a difference in the community through C&S service projects. Full-time and part-time, competitively paid internships are available in a wide range of business functions across our network: Marketing/Merchandising, Finance/Accounting, Information Technology, Procurement/Buying, Community Involvement, Warehouse Operations, Supply Chain/Logistics, Automation, Human Resources, Facilities, and Engineering. My internship at C&S gave me insight into the vast opportunities that exist within the supply chain. I worked with a supportive group of people that helped me improve my problem solving, communication, and leadership skills. The experience not only provided me with confidence in myself, but also gave more meaning to my formal education. My internship in the transportation department offered a comprehensive experience, allowing me to gain invaluable hands-on insight as well as exposure to various other departments throughout the business. The motivated culture at C&S encourages innovative input, creating a productive and fun environment. My internship with C&S has well prepared me for a successful career! If you’re passionate about making a difference and want to contribute to our mission and growth, explore Co-op positions at C&S. We employ Co-ops during all academic terms for our Transportation, Merchandising, Procurement, Engineering and Operational Finance departments. Offers are extended during both fall and spring semesters. Co-ops are eligible to participate in all collegiate hire activities including professional seminars, executive networking, social events and community service projects.